We finally are starting to hear what Google's anticipated alternative to Facebook as a platform. If you've talked to me in the past few months, you probably know that this is something I've been grappling with across a variety of projects/domains. I've talked about this issue in: Facebook Platform and Facebook as a Learning Platform. With Google's entry, there's a nice alternative to Facebook and the key word is "open." With Facebook you are somewhat forced to make a hard choice about rewiring your application to live seamlessly within the Facebook environment or pushing Facebook users across to your site which is a bit ugly. Further, you face the prospect of having Facebook rework aspects that you are leveraging. As I'm looking at the design of several applications that are either new or extensions of existing sites/applications, I find myself wanting to leverage the knowledge of social connections that exist across the network of different applications (e.g., del.icio.us, flickr, MyBlogLog, Facebook, LinkedIn, your email, discussion groups, etc.). As a user, I find it incredibly frustrating that I have to introduce relationships over and over again to these sites. Why doesn't my MyBlogLog community follow me over to Facebook? Google appears to be headed down the direction that will allow applications to take advantage of that knowledge across applications. Do you leverage Facebook because of installed based and easier, known viral adoption model even though you are locked in? Can you justify building out your own social graph (friends, groups, etc.)? Do you head towards Google's OpenSocial even though you may be ahead of your users? Answers seem to be fuzzy and turning out different in different cases. I'm hoping to hear more from other folks about what they seem happening. I was on a panel yesterday at StartupLA. The event was a good event and I ran into a few folks that I hadn't seen in a while and meet a few new people. One thing that was interesting is that I'm finally starting to run into folks in Los Angeles who run in technology circles and who have blogs. This is something that I've been having a hard time finding. However, if I'm missing others that are technology and Los Angeles related, please let me know. I went to an event by Amazon on their Amazon Web Services in Santa Monica today. The focus was S3 - storage service, EC2 - their compute cloud, their queuing system, and their flexible payment system. The S3 system is not a transactional object system, it's for larger objects, larger updates. The EC2 is very similar to having a Linux box in a colocation facility. However, there are some interesting differences in terms of not being able to control proximity of multiple boxes, having a fixed IP address and probably most interesting is the ephemeral nature of the persistent storage on the boxes. Basically, your box can go away (and its storage) at any point. You need to push out anything truly persistent to another machine and/or storage, e.g., S3. It wasn't until a couple of the customers who used it explained what's really required. There appears to be a problem with having a single point of failure around distributing the load over machines and how DNS is handled in the patterns explained. However, the persistence issue seems to have some patterns defined that work pretty well. You definitely have to architect to work effectively for this environment. There seems to be a very clear case if you are doing batch computing over objects, or if you have widely varying computing needs or want cheap storage of blobs. I'm assuming that Amazon will get the DNS/load distribution issue figured out and then this would seem to be a pretty compelling offering. LivePlanet - could have used it to bulk up for each contest, store videos and scripts on S3, and possibly do format conversions. A lot of the examples that Amazon used were media related. Other storage of media: GreenLightJobs - store media / portfolio elements, LoanToolBox - content elements/videos. What's interesting about storing media is that it's not a CDN like Akamai. Rather it's cheap, reliable storage that may or may not have good retrieval characteristics. eHarmony and MyShape seem they could use it to distribute load around matching especially during media events. There are periodic intensive compute cycles and the need to ramp up quickly based on particular needs. This would seem to be a good case for us to separate off matching and making that a more scalable operation on EC2. This will definitely be something for us to look at going forward. I'm hoping we can have one or two of the users come into our CTO Forum to talk about their experience. ..we probably’d don’t have the: a) same support infrastructure (meet-ups, networking events, etc. 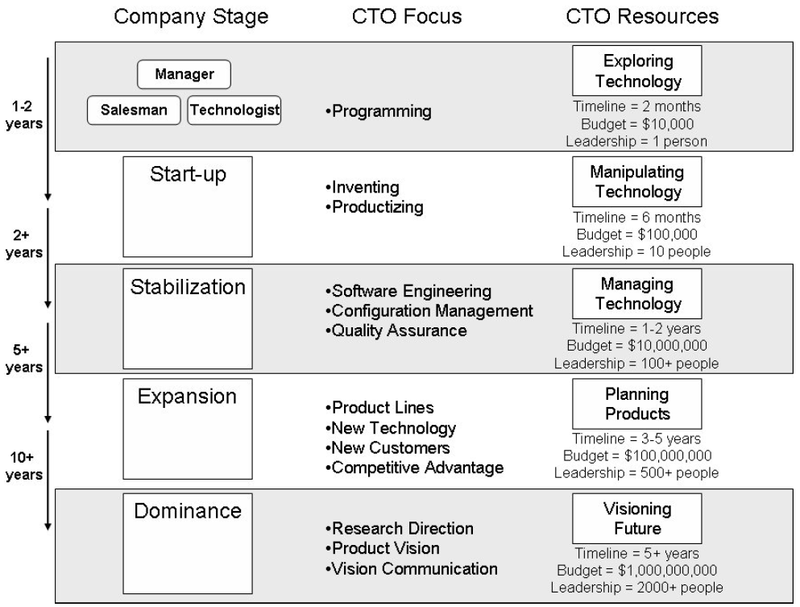 ); b) history of success; and c) abundance of start-up companies (so if one fails there is another to jump on). I’d argue that it’s all a perception, rather than a reality. There are more than enough meet-ups and networking events; we’ve got plenty of examples of successes in the area; and there are plenty of startups to jump to in case of a startup failure. Ben actually didn't address the issue raised by Will that there is definitely a shortage of really good developers, engineers, etc. willing to go work for startup companies. Will associates this with the fact that people who have great (or even bad) jobs with companies that are farther along don't want to leave. I'm not sure that's the only or primary reason. There are a lot of risk adverse people who won't work for a start-up. Being right next to lots of aerospace companies here in El Segundo, I can find them by the truckload at lunch time. But they won't leave there job. Still, there is definitely a pool of folks who will take more risk. The problem is that right now it's very competitive to find good architects and developers period. It doesn't matter the size, shape, risk of the company. Maybe in this kind of good market it's harder for start-ups, but if anything I think the wave of innovation going on right now makes it easier to find people willing to take a risk. That said, I agree with Ben that you have to know where to look and how to look. There are definitely lots of events going on. And there are tons of ways to use social networks. And if you are looking for engineers you have to be willing to go where the geeks go and look for the geeks. This is something we've discussed before in: Entreprenuer Network and Events and Networking in Los Angeles. For some reason over the past week, I've been asked by three different people I know about job opportunities that might fit them. Since, I've given them the same advice, I thought it was worth putting in my blog. How can I leverage my network? Company Characteristics - geography, size, industry, etc. The experience was interesting for me. It was an in-person meeting. I read the first three pieces of information and was trying to think of how I could help him. When I got to the list of companies, the dynamic was completely different. I had 3 contacts I could immediately point him to that would give him the lay of the land at that company and in one case might have an opportunity. I also could then think of a few more people he should talk to and companies he should consider. I went from being frustrated that I wasn't helping to pretty helpful based on this list. How do you create the list? Consider using Hoovers if you are targeting larger, established companies. Or look at funding activity if you are considering start-ups. Likely you'll have a few different types of positions/companies you are targeting. Make a different one pager for each. Also, likely you'll have a lot more than 25 companies. Don't make the list too long. Make it your top 25 where you think there will be opportunity. Once you have your one pager ready, I'd definitely use LinkedIn to see who I can already find. Based on your description, and target companies, chances are you'll be able to reach quite a few people already in those organizations. Most of them will be pretty receptive to someone who is looking to network to "get help on next steps in my career." It's probably better to ask for help that way than to say "help on a job search." If you are successful reaching into some of your Top 25, take them off the list. And then circulate a request to everyone you know asking if they could help you. Again, LinkedIn has been good for me to remember who I should contact with these kinds of things. Send the one pager once people offer to help or get together to go through the one pager together. Note: it's often best if people dedicate the time to think through the list with you, but you probably want them in front of a computer so they can look up names real-time. I'm sure other folks have ideas on this topic. If you have thoughts that might be helpful, please leave a comment. Interesting attempt to create a start-up over the course of a weekend. They failed to get it done in time and they make it sound like they are surprised that it might take longer than a day of programming to build something. It's funny how this expectation around start-ups persists that things can magically be built much, much faster. They also ignored that a large group of developers can't necessarily build something much faster than a small group. It's the old adage that 9 women can't make a baby in one month. Still there's something to be said for the push, drive to even create a unified product vision in that short of a time. From Ask the VC - What are typical compensation numbers? I've worked with several businesses that were essentially based on driving traffic via search engine optimization (SEO). There are a wide variety of techniques that can be used, but getting high rankings is not easy and highly volatile. I just saw a Forbes article talking about Google Hell - getting placed in the secondary index. Bottom line - if you are basing your business on high rankings via organic search, there's pretty incredible risk. And the risk is compounded if you are using techniques that are somewhat gray. The best approaches rely on accumulating quality content and quality links and doing minor optimization on top of that solid foundation. It doesn't prevent Google Hell, but it certainly reduces the chances. I've somewhat fallen off the map on this blog. Been traveling and consulting with a bunch of early-stage and growth companies. Really fun stuff these days. One of my recent fun experiences was doing a presentation at Harvard Business School (HBS) on the implications of Web 2.0 type tools (Blogs, Wikis, Social Bookmarking, RSS, RSS Readers) on corporate learning and someone like HBS. In the corporate space, these tools have quite an implication in that most training organizations get displaced for knowledge transfer as content gets created by end-users/learners instead of by the training organization. My expectation is that the classic corporate training organization is going to be a slow downward path retaining compliance training and developmental activities - but these will become smaller and smaller part of how employees learn (as compared to informal learning). For HBS, the issues really are quite different as they want to continue to be a "transformative experience" ... a truly developmental kind of experience. At the same time, graduates from HBS need to be armed with how to operate in a virtual work-team world who use the tools as a means of sharing knowledge and collaborating. Further, as HBS looks towards providing on-going value to students, these kinds of tools become significantly more important. It's not that we'll see radical changes from HBS, but certainly adoption within the core and as part of add-on services is highly likely. It's an interesting group of folks from diverse backgrounds. It's also been interesting to see the interaction of tools involved - Social Networking, Blogging and a Discussion Group. Organice Discussion - someone posts something interesting, lots of bloggers post on the topic, distributed discussion ensues. Tag Memes - Someone posts a question and "Tags" five people to give their response. See Five Things Meme as an example. Discussion Group Hub - questions/topics are raised via the discussion group and can go out into the blog world to get a more diverse audience - which is now happening with this group. I'm not sure which of these make sense in what case. Certainly it suggests that there's need for something more than MyBlogLog, Explode, CoComment, etc. to help bloggers and blog readers with comments. But this still leaves me with lots of questions about the interplay between these tools, so I'd ask people who author a blog, use LinkedIn (or other social networking), and participate in discussion groups, how do you use these tools. How do you use Discussion Groups? What's the interaction between them? * I definitely use LinkedIn for Specific Requests - Ex. Open Source Business Models, speakers for Web 2.0 event I did last fall. * LinkedIn has been great to keep track of people I know and their current contact information. I regularly do wine tastings here in Los Angeles with some interesting folks I know. LinkedIn has been my primary tool for keeping track of who to invite. * I definitely check people out using LinkedIn. It's a great way to get a background on folks. * I've not found that much use for LinkedIn to help my blogging, but I'm starting to think about this. Maybe this meme will help. * I've not been very active in the discussion group on particular topics. However, it definitely has served as a hub. This suggests that something more than MyBlogLog is needed to create hubs from groups of bloggers. That's probably the value of this group. * Not much right now between LinkedIn and my blog. Certainly my LinkedIn profile provides a better public profile for me. Otherwise, I've not seen much. * I'm constantly frustrated by conversations that take place in discussion groups that can't cross the border into the blog world. And, I don't like to copy and paste. It's a relatively new concept, but it likely has legs. If you’re starting a new internet company, its important to know who your audience is, and to make sure that you don’t let your own experience and that of other Time Poor people guide you wrong. This is an interesting concept and not something I've seen articulated this way. What's interesting is that I've been seeing opportunities to use social marketing for businesses that typically target Time Poor audiences. Does this mean that they'll have lower response rates? It's certainly something to keep in mind. designed for Time Rich buyers. I would agree that Apple's product design would suggest that it aims at Time Poor buyers. However, the ubiquity of the iPod including use by many folks who certainly would fall in the Time Rich category (lots of time to play with music) suggests that their product and marketing appeals to both segments. Doesn't this call into question the central concept of Time Rich and Time Poor and the importance of making a choice prior to product design which audience you are going after? 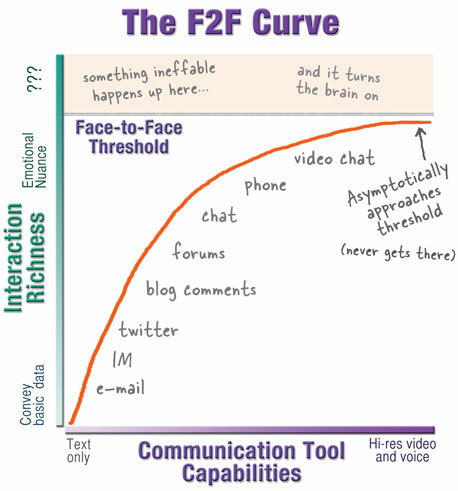 Kathy Sierra has a great post today: Face-to-Face Trumps Twitter, Blogs, Podcasts, Video... and she provides this picture: It shows that while we slowly approach real-time, realistic virtual conversations, it still isn't quite the same thing as being there. As an aside, I personally question that view. In the long run - 25 years - we will all be walking around with devices that attempt to make in-person as good as doing it via online. Online you will have an incredibly realistic experience (think how good virtual actors are these days - add 3D - presence based audio - first person shooters). And because you are online, you will have access to all sorts of information about the people, what their interests are - it will be easily captured. The challenge will be getting people used to this - hence the 25 years. Get people together in the real world. Meet People within a given Geography Online who share passion around Technology, Start-ups, etc. Find avenues to network with these folks. So, what I've ended up doing is planning our own events (wine tasting) and just inviting people who I know are interesting. We've done one so far, and it's great. Kathy's on the money on this one. Great post - 8 Ways The Internet Changed Software Marketing - is an interesting take on how different it is these days to market software. Good stuff. The NY Times did a piece today on MyShape, a start-up in Pasadena - Log in Your Measurements, and the Clothes May Fit. As impressive as these results may be, myShape’s approach will probably fail to gain a mass audience unless the company can somehow simplify the measuring process, said Sucharita Mulpuru, an analyst with Forrester Research. “They’re probably a little ahead of their time,” she said. Having worked on eHarmony where the intake is 2 hours and was completely counter to the prevailing trend, I think the analyst missed the point. Clothes are very personal and it's really a pain to find stuff that's going to look good on you. Maybe it's because I'm 6'6", but I think most clothes shopping really stinks and when was the last time that a sales person was actually helpful. I really think MyShape has a great concept. With the growth of choices, it becomes harder to make decisions. Having help narrowing choices is what it's going to be about going forward. Elgg is the most popular white label social networking platform in the world powering over 2000 networks. However, Elgg could power 100,000 networks and it would make no difference - there is no revenue stream as we give everything away under a GPL license. I understand his frustration. You create something that has value and gets traction and yet you've created it in a way that the software is considered "free." Thus, you may starve working on your labor of love. However, there are lots of companies that are making money from open source and freemium models. A friend of mine has a company that builds open source applications in spaces that are a bit less innovative than Elgg, but they do very well financially through the packaging and support models. One of his companies - Gluecode - was sold to IBM for a pretty good price. There are quite a few other Software Development Companies in Southern California working on open source and/or freemium business models. Common revenue streams are consulting, training, support, customization, upgraded versions for corporate applications, etc. The fact that Dave says that there's "no revenue stream" and that he's getting good traction suggests he must be missing something. The discussions on the posts are quite interesting - and heated. Luckily Harold Jarche pointed us to other discussion on open source models. I recently downloaded Google Maps Mobile for my Treo. It's works great. And there was a big surprise. It includes traffic! This is something that I've wanted on my wife's GPS for a while. If you haven't checked it out, it's pretty amazing. My only minor complaint is that it doesn't have a menu option to disconnect the phone from the data connection. I was just pointed to a set of great podcasts done by Stanford B-School and particularly, I just listed to the podcast by eHarmony's Greg Waldorf. I don't know if these are true, but still, the impact of the vision of the original founders Neil Clark Warren and Greg Forgatch is amazing. A couple of things I should add - Greg didn't mention the technical challenges they had (scalable complex matching algorithm) and the issues they had with an initial developer. He was asked about how you get a network business going - and it was extremely challenging. One of the things that Greg Forgatch (the original CEO) should be credited with was testing many different marketing approaches until he found the ones that worked. Still it was gratifying to hear the numbers. Saw a post by Paul Kedrosky pointing us to Graeme Thickins on How Stanford Does It. It's interesting to think about how universities might want to have their staff better aligned with moving ideas from the lab to start-ups. In my experience, this has been really hard to do successfully. I ran across a post in Read/Write Web - Does Location Matter in Web Innovation? that talked about a recent NY Times article When It Comes to Innovation, Geography Is Destiny. 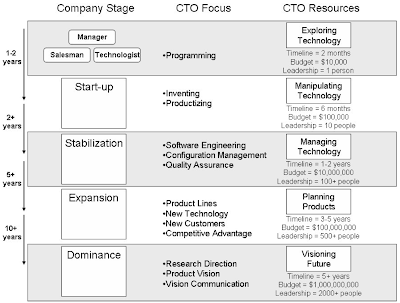 I've personally been involved in the start-up world in Los Angeles for about 15 years, and have had the opportunity to work on many early-stage companies (e.g., eHarmongy) as an acting CTO. LA is a vibrant community with a rich network of angels that fund early stage companies, lots of VCs, easy access to big media, lots of innovation in media, mobile content, games, green, health care, and many, many others. Probably the biggest drawback of Los Angeles is the distance and traffic that makes networking more difficult. Evening events in Orange County require about 2 hours of round trip drive time. It has to be a pretty good event for it to be worth attending. Some events, like a recent Tech Coast Angel event at UCLA are really worth it. But some events you don't get quality attendees and then its a drag to drive that far. My only other complaint is that right now it's very hard to find good technical people at all levels. Of course, that's probably even more true in Silicon Valley. I'm part of a CTO group that meets once a month to discuss various topics. About 18 months ago, the entire group began to mention that they were having more difficulty finding good developers. Since then it has become much harder to find people and while we are talking about hiring relatively small numbers of people, the typical sources of candidates don't seem to be working. I personally believe that there are lots and lots of good developers working inside of organizations who would love to work on the interesting projects that we work on all the time, yet they aren't out actively looking, so it's almost impossible to find them. If anyone has ideas on how to reach into to find candidates or other ways to find good people, I would love to hear it.